Gold softened overnight in a range of $1297.50 - $1303.20, tripping some sell stops under the $1300-$1303 former resistance level (7 tops 6/1, 6/5,6/6, 6/7, 6/8, 6/11, and 6/12 highs, $1300 – down trendline from 5/15 $1315 top, 50% retracement of up move from 12/12/17 $1236 low to 1/25/18 $1366 high, $1300 – psychological level, options). It was pressured by a firmer dollar (DX to 95.14, fresh 7-month high), which was helped by weakness in the yen (110.45-110.90, BoJ had dovish assessment of inflation, no hurry to scale back stimulus), and continued weakness in the euro ($1.1543 – fresh 2-week low, ECB’s decision yesterday to keep rates low through next summer still resonating). Mostly weaker global equities were gold supportive with the NIKKEI up 0.5%, the SCI was off 0.7%, European markets ranged from unch to -0.8%, and S&P futures were -0.5%. An official statement from the Trump Administration announcing 25% tariffs on a list of $34B of Chinese goods and a statement from China threatening retaliation weighed on stocks, and helped take the US 10-year bond yield down to 2.19%, it but failed to stem gold’s decline. Selling on the NY open knocked gold down to support at $1294 (up trendline from 12/15/16 $1123 low). This was followed quickly by a stronger than expected reading on the Empire State Manufacturing Index (25 vs. exp. 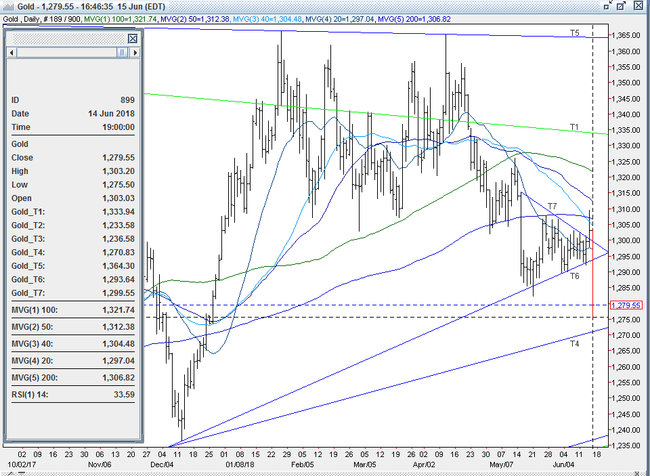 18.5) that brought the DX back up to 94.89, and broke gold’s support at $1294. The yellow metal plunged through support at $1292-93 (double bottom – 6/12, and 6/13 lows) to reach $1288, where it found support at the double bottom low from 5/22-23. A fair amount of long liquidation was seen. At 9:15 AM, worse than expected readings on US Industrial Production (-0.1% vs. exp. 0.2%) and Capacity Utilization (77.9% vs. exp. 78.1%) helped to weaken S&P futures (-21 to 2765). 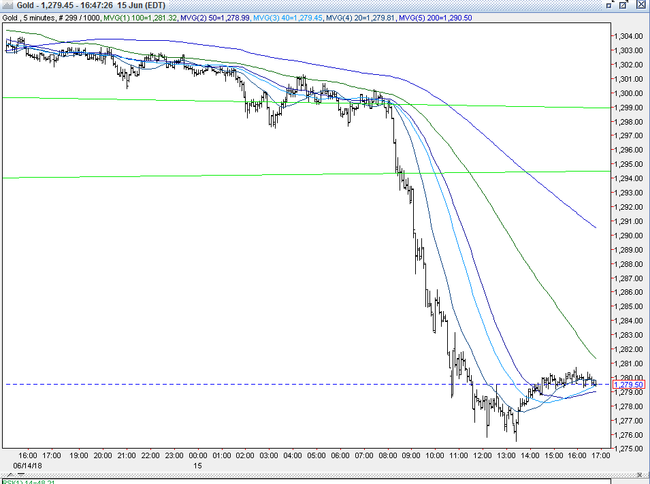 A dip in oil (WTI to $64.58) contributed to the move. The US 10-year bond yield sank to 2.889%, and the DX dipped to 94.65 – but gold was only able to manage a slight bounce to $1289.50, as strength was sold into. During the late morning and into the afternoon, US stocks turned briefly positive (S&P +2 to 2783), and the 10-year yield rose to 2.921%. The DX rebounded to 94.84, and pressured gold further down. Gold took out the $1288 support, and the $1281-82 double bottom (5/21 and 12/27 lows), on the way to $1275.50 (6-month low), where support in front of the options strike held. Further long liquidation was seen. Later in the afternoon, news that China announced retaliatory tariffs on $34 B of US goods knocked US stocks from their highs (S&P finished -3 to 2779). The 10-year yield hovered around 2.92% - 2.925%, and the DX ticked down to 94.75-94.80. Gold came off its floor to reach $1280.50 and was $1280 bid at 4PM with a loss of $23. Open interest was up big – 10.2k contracts – reflecting a sizeable amount of new longs from yesterday’s rally (most probably bailed today). Volume surged with 357k contracts trading. The CFTC’s Commitment of Traders Report as of 6/12 showed the large funds adding 7.4k contracts of longs and cutting 1.4k contracts of shorts to increase their net long position to 120k contracts. While an increase normally helps sentiment, the longs that were added were probably puked out during today’s selloff. However, going forward, this NFLP remains relatively and historically small, and it leaves the gold market set up well to move higher - provided there is a spark - as there is plenty room for sidelined longs to enter. Bulls got a little out in front of their skis yesterday, especially with algorithmic trading initially lifting the euro off the ECB’s plan on tapering, causing the DX to fall and gold to trip its 200-day moving average. On top of that, dip buying toward $1300-$1303 kept the market a bit extended in the face of a significant run up in the USD. Today’s pruning, while painful, is seen by some patient bulls as necessary and healthy for the market to eventually turn higher. They point to the still relatively and historically low NFLP, and see a market approaching oversold (14-day RSI = 33.8). Bulls expect gold to form base in the $1273 (double bottom, 12/25 and 12/26 lows) and $1275 area, and will look for a 50% retracement of the move down from yesterday’s $1309 high to today’s $1275 low at $1292. Many bears took profits on the way down today, and will look for significant bounces to resume selling into. Other bears are hanging on looking for a further selloff. They expect further strength in the dollar to lead to a breach of the double bottom at $1273 to trip additional long liquidation to test next support levels at $1265 (12/22 low), $1261-63 (triple bottom - 12/19, 12/20, and 12/21 lows), and $1253 (double bottom – 12/15 ,12/18 lows). All markets will continue to focus on geopolitical events, developments with the Trump Administration (especially on US-China trade), oil prices, and will turn to reports Monday on Japan’s Trade Balance, US NAHB Housing Market Index, and comments from the ECB’s Draghi and the Fed’s Dudley, Bostic, and Williams for near-term direction.